"The Role of a Research University to the Local Community"
Member cities exchanged extensive opinions about eco-friendly city development in the global era, respected each city’s knowledge and experience, and agreed to develop themselves as sustainable cities. 1. By the practice of low carbon and green growth, and the competition in good faith between member cities, we give a new boost to the Asian-Pacific area and try to develop as the center of the world having strong competitiveness in the international society. 3. For balanced development in the Asian-Pacific area, we agree on the necessity of the exchange increase in not only environmental areas but also economic, culture, and tourism areas. In order to realize this, we cooperate with each other. Item 1: Admission of Changsha City, People's Republic of China into the Asian-Pacific City Summit. Item 2: A Mayor's Summit will be held in 2015, and the host city is Vladivostok City, Russian Federation. Item 3: The host city for the conference in 2014 will be either Bangkok Metropolitan Administration, Kingdom of Thailand or Changsha City, People's Republic of China. Both candidates have expressed their interest in hosting the conference in 2014. The host city will be decided by November 2012 through deliberation in writing. 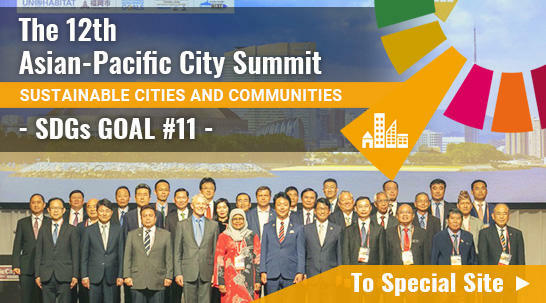 Based on an unanimous decision at the 9th Working-Level Conference in Kagoshima City in August 2011, the 10th Asian-Pacific City Summit opened with the main theme, "Urban Network Development for Low Carbon Green Growth." The Summit was held in Pohang City, Republic of Korea on July 27. The approved agenda items are the following: the admission of Changsha City (China), the designation of either Bangkok Metropolitan Administration (Thailand) or Changsha City (China) as the host city for the 2014 conference, and the designation of Vladivostok City (Russia) as the host city for the Mayor's Summit in 2015 (See attachment "The 10th Asian-Pacific City Summit Agenda"). At the summit, 13 cities reported their efforts in dealing with various environmental issues. Among them, Miyazaki City suffered from an outbreak of foot-and-mouth disease in 2010, and Bangkok Metropolitan Administration experienced flooding last year. In a special session, the two cities gave presentations on how they recover from the damage. The participants listened intently to their presentations. The summit successfully ended with an adoption of the Pohang Declaration. According to the declaration, participating cities will aim for low-carbon-green-growth-oriented city development, and will pursue the common goal of becoming the core cities in the Asian-Pacific region through reciprocal understanding and cooperation (See attachment "The Pohang Declaration of the 10th Asian-Pacific City Summit").